And check out the video highlights from the episode, after the jump. 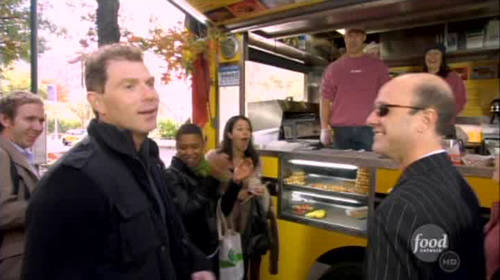 Posted by Zach Brooks at 9:00 am, January 21st, 2010 under Bobby Flay, Videos, Wafels and Dinges. Woo! Whooping on Flay is always good! Really enjoyed the show, but the competition was Liege wafels, not Brussels wafels. I always love when Bobby Loses. I dont hate him but he looks like a gracious loser and growing up with competitive siblings… its something i never get to see! Mai Cablevision attrape le syphilis et meurt. HGTV and Food Network are back on Cablevision!